Have you been playing the newest Call of Duty and thought to yourself, “Man I wish this game had limited-use jetpacks!” If so, you’re in luck. The latest iteration of the massive franchise, published by Activision, is making waves around the video game community just like it has for the last few years. With a shift in developers, Sledgehammer Games, this time around CoD brings the series into the near future with sci-fi gadgets galore. Yet again the world is in constant conflict, and it is up to the new augmented soldiers to take care of things. In Advanced Warfare private military company, Atlas, is much of the focus for the story line. A digital Kevin Spacey plays the role of the company’s founder, and consistently spews metaphysical tripe about the changing world and the role of corporations in combat. Most of the story felt gleamed from a Metal Gear Solid game, and although Sledgehammer tries it best to force-feed you some gripping circumstances, they fall short. Inevitably, it leaves you feeling like the game is a caricature of itself. The story feels more like a mechanism to introduce and drive the new features and gadgets of the game than a device to connect a player to something cohesive. The biggest change of pace for this year’s title isn’t some cinematic set-piece or gripping storyline. It is the introduction of soldiers outfitted with military-grade exo-skeletons that put the “advanced” in Advanced Warfare. Besides the new gimmick, it is pretty much the same Call of Duty you have played in the past, but this time it involves even more frantic-paced action. The exo-skeleton, basically an augmented booster jump pack, allows players to leap on top of buildings or hover in place and unload a few rounds, all with a couple taps of a button. This new feature has drastically increased the size of the levels and the rate of character movement. If you thought Call of Duty was hair trigger before, get ready to beef up your snap responses. Barring a few hiccups at launch date, some of the Internet cried foul on the connection issues, the multiplayer is business as usual for the series. 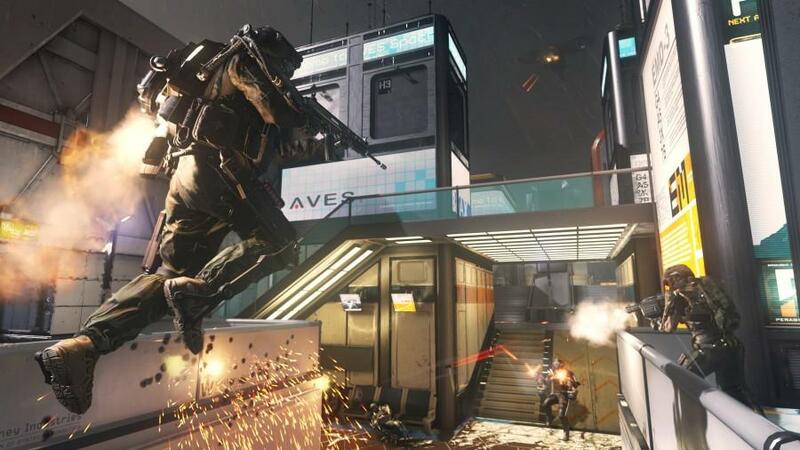 The multiplayer component, which is why most people buy a Call of Duty Game, is now even more frenetic. As you can imagine, having the ability to hop effortlessly onto buildings or across huge swathes of the map has increased the pace drastically. No longer are “campers” rewarded with holding out in some remote corner; someone jet packing across the map will find you and it won’t be pretty when they do. The new mechanics hearken back to the days of Unreal Tournament glory with players darting around the arena at breakneck speeds. The guns play the same as they always have, with the exception of a futuristic laser cannon. Players can now earn exclusive guns or gear to modify their online character cosmetically or mechanically with the addition of supply drop crates. This new, seemingly random, loot system offers some nice incentive in the online department. The online community has either gotten older, or it is just a little less toxic this time around. After a few days of playing, only minimally did I get told I deserved “the ebola’s” and just a few times was my mother sleeping with some 13-year-old from Southern California. Call of Duty Advanced Warfare does provide some refreshing entertainment in the series; however, it still seems stale for some reason.